I was creating a report with a tree map which had about 1300 rows. 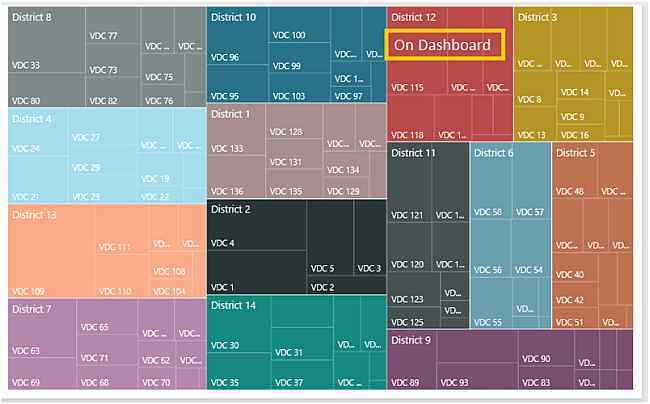 Each row had a VDC name assigned to it and each VDC belonging to a district. Each district had in average 7-8 VDC. And there were about 100 rows of data for each district. But when I created the tree map, the above given warning was shown and the graph did not reflect the actual data. I was not able to understand what was actually going on. I was doubting my may of making the report. I also tried other visualizations to see if the problem was only with the tree map, but the same happened in others too. Out of my frustration, I uploaded that “.pbix” file on to www.powerbi.com even when I knew there was something wrong with the report. I was pleasantly surprised to see that the report reflected perfectly on the website. Therefore, anyone having the same warning shown should always try to upload the file online to see if it still persists. This only seems to be a problem on Power BI desktop and not on the portal.